It’s been a long while since my last post. Life just keeps getting in the way of all my good intentions. With Easter literally around the corner (how did that happen?) 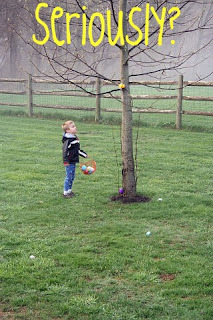 I’m sharing my favorite Easter posts, ideas and traditions. A few are mine, a few I found on Pinterest. But they all will help you get moving on the Easter planning. 1. Glow in the Dark Egg Hunt. Put a small LED light inside those plastic eggs. This is a great idea for all ages! 2. 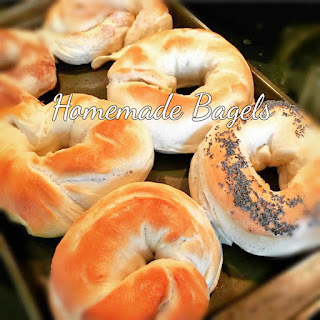 Handmade Charlotte has some snazzy recipes for Easter. Carrot cake, an Easter Bunny pancake breakfast and my favorite Easter Extravaganza Bark. Dessert does not get more whimsical or festive than this bark..
3. Need Easter basket ideas? 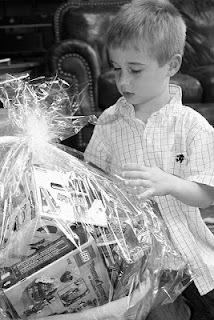 I made a list a few years back of my favorite basket stuffers. 5. 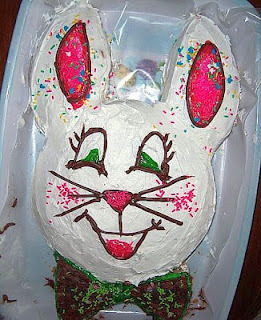 Bunny Cake. 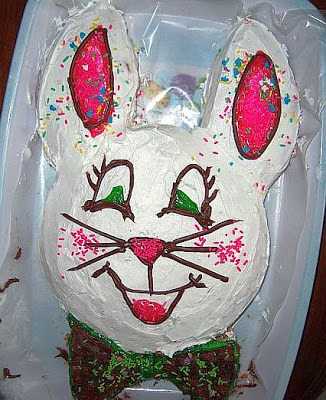 Every Easter, we make the Bunny Cake. It’s tradition. 6. Your Homebased Mom has an easy idea which doubles as dessert or a great Easter gift - chocolate dipped peeps! Roll them in sprinkles and box them up with a bow. 7. I know Easter is all about candy, but these sugar cookie bars are a nice change up from the standard Easter desserts. 8. If you don't want to fuss over hosting a big Easter dinner, serve brunch! Mimosas, Belgian waffles or french toast, eggs, rolls, cinnabuns, bacon, sausage...the possibilities for the menu are endless. Set a festive table and set everything up as a buffet. 9. I've never tried it, but dying eggs with Kool Aid is something I've heard works well. Totally the Bomb has an informative post with all the instructions you'll need! 10. Bunny Masks! 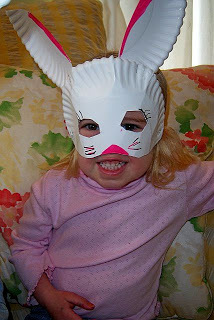 For parents of little ones, make these adorable Bunny Masks for them to wear to their big egg hunt! Busy lives have taken over our existence. We have time for nothing. But the truth is, we DO have time. Think of all the time we spend on our phones, in our cars and catching up on the DVR. We do have time, it’s just that we don’t manage it as well as we used to with all the distractions. I'm always trying to keep my family at the center of my life. They are the most important, and I only get one shot at raising my kids. When they are adults, I want to know I did what I could to teach them about a healthy lifestyle. I want to instill in them that they are loved. I want them to know they were, and will always be, my greatest accomplishment. Life is meant to be lived, and I'm sharing my five favorite ways to bring my family closer together. They are easy, manageable and they work. This doesn’t have to be fancy. It just has to involve snacks and pajamas. Decide on a movie ahead of time, which will alleviate the half hour or more that everyone usually argues over what to watch. Make the plans clear. Movie, what time, what snacks and pajamas. That’s it. Give the kids more than one reminder, and get excited with them. Naturally, electronics are NOT invited to join the fun. This seems simple. It doesn’t seem like it should be an event that needs to be planned. But let’s be honest, how many families gather round the table and have dinner together? All at once? 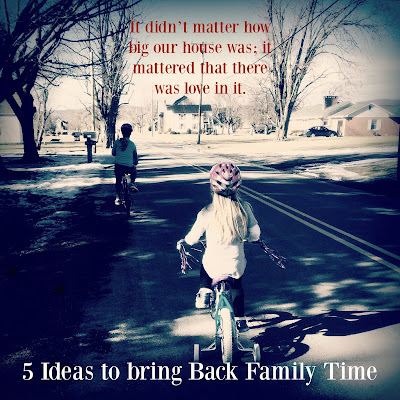 We make time for what is important to us, and we all can make time for a family dinner once a week. We have been sitting down on Sundays and Wednesdays. Our schedule right now has us all home those two nights. This will change, but for now, it works. The trick with bringing the family dinner back is to involve everyone. Give the kids jobs, and let them help. Little ones can set out napkins, older ones can take drink orders (my preteen loves that job). 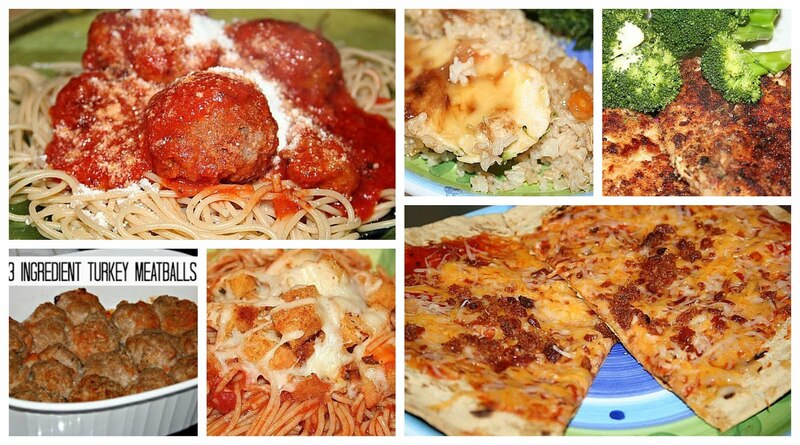 Teens can help cook (life skills!). It works. I promise. Just don’t forget conversation. We ask one question that everyone must answer. We go around the table. It’s amazing the stuff you learn just sitting around the table. Oh, and again, NO PHONES. I love this game. My kids love it too. When we are in need of a fun, refreshing night I set up BINGO. I buy prizes like candy bars, bouncy balls, bubbles, chalk, scratch off tickets and I set out dollars. I make sure there are prizes everyone will like. And then we play BINGO. The only rule is that if you win two in a row you have to choose another player who HASN’T yet to pick a prize. This keeps the tears away, and it reminds the kids that their siblings DO like them. I hate the word “chores.” I prefer “life skills.” When we teach our kids to make their beds, clean their toys or sweep the floor we are teaching them skills they will use the rest of their lives. We are teaching them to be responsible. Just last night I explained to my younger son that his future roommate will not like his clothes all over the floor. His future wife will be driven mad by his open drawers with pant legs hanging out. No one likes that, and no one wants to clean it. I am doing no one any favors, my son included, by allowing his room to remain in such an appalling manner. Take a day and teach everyone a new life skill. It can be anything. I declared one evening Life Skills Night. My kids love this (totally kidding). I usually just announce to the house “Life Skills Night!! !” and they all groan. But they laugh too. And they do enjoy the attention from mom, even if they act like they don’t care. I helped my older daughter pour pancakes on a griddle. I showed my older son how to work the laundry (again) and I explained the art of swiffering the floor to my younger son. My youngest learned to load silverware correctly in the dishwasher. Get outside. Spring is in the air. If you can’t arrange a game to run around and get active, just go for a walk. Or a bike ride. Plan a day at a lake, or the park. The key is doing something together with no electronics allowed. Even if you pull weeds and put on the radio it’s going to make a difference. Bring family time back to the center of your life. The kids will start talking and sharing more about their day. You will go to bed satisfied and feeling accomplished. You will start to feel connected again. I promise it will change everything.